I have always attempted to draw attention to the 17th amendment, and the deleterious effect that it has had on the country since its ratification. How many people that you encounter on the street, would know what the 17th amendment is? I would have to say that the number would be low, especially since most Americans cannot name the 5 components that make up the 1st amendment. The short answer regarding the 17th Amendment is that it changed the method of choosing Senators from appointment by the state legislatures to direct elections by voters. I see the Senate disaster that is taking place right now in DC as roughly half of current US Senators attempt to derail the nomination of a Supreme Court Justice (Kavanaugh), days before a committee vote as a consequence of the 17th Amendment. I don’t usually like to deal in the land of woulda, coulda, shoulda, but for the sake of my argument here, let’s just pretend that the 17th amendment was never proposed and US Senators were still appointed by the State legislators of Senators’ respective states. How many state legislatures have a red majority currently? How many states have majority Blue? How many governorships are currently held by Republicans? How many by Democrats? 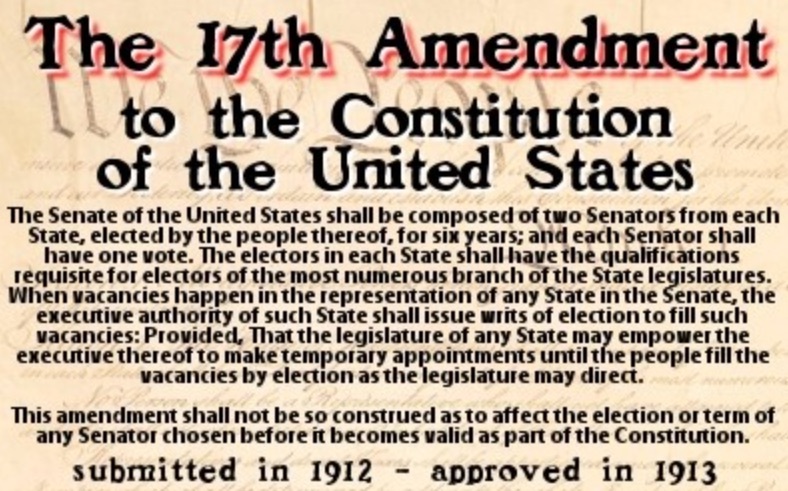 What would the Senate look like right now if the 17th amendment never existed? In 2017 26 state governments were 100 % red, meaning that Republicans controlled both state houses and the Governorship in those states. As of November 2017, 67 State legislative chambers had a Republican majority, whereas 32 legislative chambers have a Democrat majority. Without the 17th amendment, we would have at the very least, a super majority in the Senate on a consistent basis. This did not happen because the progressive movement that started to take hold in the early 1900’s wielded much power at that time because they had the numbers in Congress to push these things through. During this period, many progressive wish list items became a reality. The Federal Reserve, the 16th amendment that kicked off the federal income tax that still plagues us today, and the 18th amendment that started the era of prohibition. Luckily, prohibition ended in February of 1933, with the 21st amendment that effectively repealed the 18th and the Volstead Act. Utah was the 36th state to ratify the 21st amendment in December of that same year. This is the kind of chaos that progressives like to throw fuel on in order to force legislatures to have knee jerk reactions due to the perceived urgency. 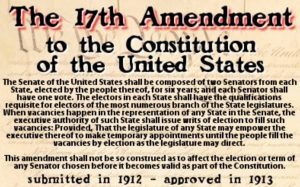 The 17th Amendment is a great illustration of a historical event that literally changed the course of America to our detriment. It gave us a group of Senators that grandstand for television cameras, spend much of their time raising money to support expensive statewide campaigns, and look in the mirror and see future presidents. They have little incentive to devote themselves to contemplating, developing and executing policies that benefit our nation. They thrive on stoking division and discord rather than building consensus. Senators bring themselves center stage while posturing during moments like the Kavanaugh hearings. 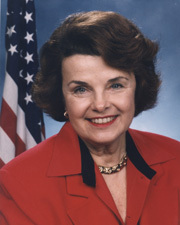 A fair example is how Senator Diane Feinstein sat on potentially critical information bearing upon Judge Kavanaugh’s fitness from Christine Blasey Ford for six weeks as the confirmation investigations and hearings moved along. These are the effects of the 17th Amendment. That is why we have to be very careful as we navigate the current political climate. We must be cognizant of the potential to create precedent for future lawlessness. This is definitely food for thought. Jason A Brown currently works for a Department of Defense contractor at a clinic in Brandon Florida. He is currently in Pediatrics but has also worked Family Health. Aside from working full time Jason is also doing online classes part time with Saint Leo University pursuing a BA in Criminal Justice/Homeland Security. With a full time job, part time classes, a wife and 12 year old daughter, Jason still finds time to educate people on America’s founding document the US Constitution, through his writing, as it is one of his passions.